The MBM 0857 SF 2 Wire-Stitch Bookletmaker saves time and money. Wire-fed stitching system provides lower operating costs than bookletmakers using pre-formed staples produces booklets up to 100 pages* low maintenancejogs, stitches, and folds up to 65,000 booklets without replacing wire spools runs on-line with a variety of collators (interface is included) including the MBM FC 10 easy to use, push-button controls with 6 digit counter staple leg adjustment feature allows staple length to be custom fit to the size of book being run heavy-duty clutch and bearings moveable, magnetic stitching heads one-step threading for quick and easy set-up knife fold with dual fold rollers for crisp, consistent folds powered exit conveyor transparent safety access coversmachine will not operate with covers in open position includes back jog, and stand with casters optional activated clinch, and on-line corner/side stitch gate. 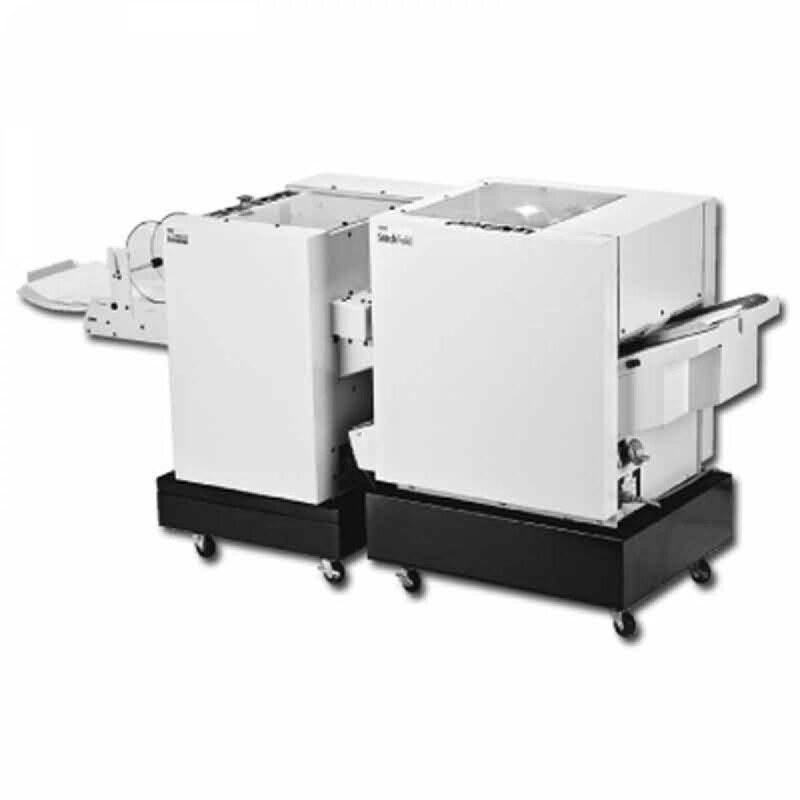 Paper Size (Trimmer) - 4 3/4" x 8 3/4" to 12 11/16" x 18 1/4"
Paper Size (Bookletmaker)	4 3/4" x 8 1/2" to 12 3/4" x 18 1/2"
(D x W x H) 24 1/4" x 48 1/2" x 24"